Even the faintest glimpse of the sun and everyone heads to the coast, and this roadside diner is located on one of the busiest routes to Southend-on-Sea in Essex. Housed in what used to be a Little Chef, it boasts an American theme, with a wide range of hotdogs, burgers and ribs, as well as serving breakfasts until 1.30pm, not to mention buttermilk pancakes and waffles, too.Located just after the turn-off for Basildon and Wickford on the A127, on the Southend-bound carriageway, it sits alongside a Shell filling station. There’s a large car park and seating is in booths, with stateside memorabilia all around the walls. There’s a wide-ranging menu to choose from, as well as specials like the pulled pork burrito or steak philly sub that was on offer the day we visited. There’s a wide choice of different burgers, a selection of hot dogs, and alternatives like steaks, ribs and spaghetti and meatballs. 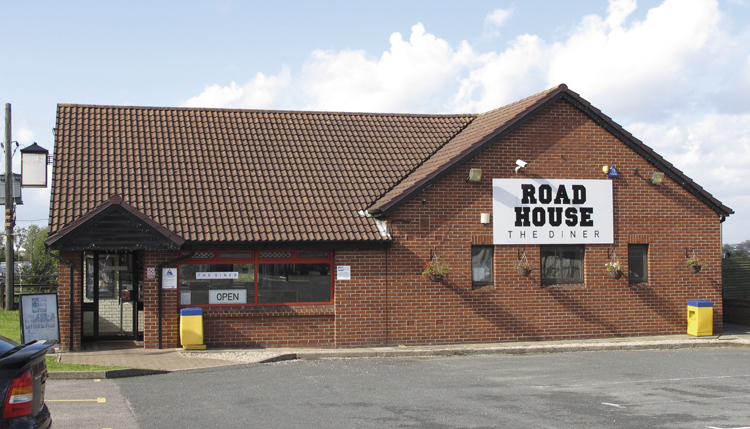 It was mid-morning when we visited, so we plumped for the Roadhouse breakfast, encompassing a couple of sausages and hash browns, a generous serving of beans and an egg, as well as a couple of slices of toast. Its arrival was long enough for you to know that it had been freshly cooked, rather than being sat under heat lamps, and was nicely presented, with the sausages in particular having a nice, herby flavour. The portion is a good size, tasted good and most importantly, it arrived piping hot. And at £6.50, the price was well judged relative to the size of the portion. Alongside we chose a strawberry milkshake, which was freshly made with ice cream and its consistency harked back to the hernia inducing shakes that McDonalds used to serve in the 1980’s – or in other words, proper milkshakes. For anyone heading along the A127 in Essex, Roadhouse The Diner is a friendly, good value refreshment stop that serves fresh, piping hot food. The American theme offers something a little bit different to the traditional roadside café, with a menu that makes it tough not to find something that tickles your tastebuds.